With the holiday madness almost behind us and the end of 2017 in sight (we can’t believe it either), it’s time to start thinking about those New Year’s plans, and sooner rather than later. 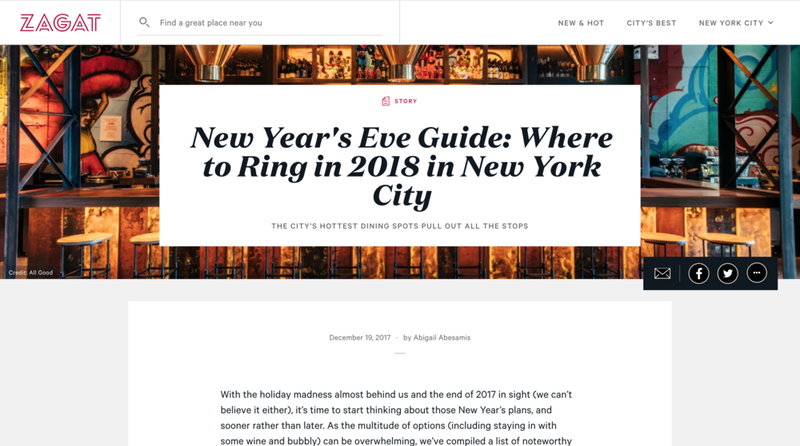 As the multitude of options (including staying in with some wine and bubbly) can be overwhelming, we’ve compiled a list of noteworthy celebrations happening around NYC to help you with your decision, from refined tasting-menu dinners to a lodge-themed, flannels-encouraged party. Wear your comfiest flannel and puffiest down vest to this après ski–inspired celebration known as Camp Porchlight: Winter Lodge. Eggnog, hot holiday punch and other themed cocktails will be dispensed throughout the night, including Long Underwear (Hendrick’s gin, Green Chartreuse, citrus, raspberry vanilla syrup) and Homestead Lift (Tullamore DEW Irish whiskey, brown butter–infused apple brandy, Amaro Nonino, holiday spice syrup). Guests can also forage for elusive truffle martinis. To eat, expect passed hors d’oeuvres and smoky fireside fare including hushpuppies with foie gras and pear purée, braised short ribs with a pomegranate glaze and whole roasted cauliflower with garlic herb breadcrumbs. The festive setting is complete with snowy tree branches, live bluegrass, blues and country music and a midnight toast with mini bottles of bubbly. El Vez begins its New Year’s festivities with a kid-friendly celebration (6–8 PM) complete with tortilla making, games, a special buffet (think chicken fingers, mac ’n’ cheese and carrot sticks) and an early countdown with sparkling grape juice. After 8 PM the “adults” party kicks off with a mariachi band and a midnight tequila toast. The regular menu will be served with added specials like rabbit and chorizo tacos with celery root and green apple, hamachi ceviche with kumquats and serrano pepper, and chiles en nogada. For New Year’s, Dale Talde is hosting a family-style dinner and dance party. On the menu is a raw platter (East Coast oysters, king crab leg, tuna tartare, tingling pepper mignonette, Thai basil aïoli), a dim sum platter (sweet potato dumplings, braised short-rib dumplings, beet rice roll, matzo ball ramen) Châteaubriand and a dessert platter (PB&J sesame balls, mini baked Manila, crispy flan). Dinner transitions to a dance party, with a DJ, live music and an open bar from 11 PM–midnight. Price: $100 for early seatings (7–9 PM), $155 for later seatings (9 PM–close), $40 for one-hour open bar and midnight champagne toast only. Tickets can be purchased here, and guests must call the restaurant to confirm. At the newly relaunched Momofuku Nishi, pasta pro Joshua Pinsky (executive chef at Nishi and a Momofuku Ko vet) has crafted a variety of plates as part of a four-course chef’s tasting menu for New Year’s Eve. Dish options include beef carpaccio alla vitello tonnato, lobster fra diavolo (a one-and-a-half-pound lobster on a bed of garlic and chile spaghettoni), roasted skate wing (served with brown butter, cauliflower and lemon) and vanilla semifreddo with olive oil and plum vinegar. On the drinks front there’s champagne by the glass and bottle, plus festive cocktails like Rhymes with Glitz (glittery Greenhook gin, lemon, sugar, Prosecco). Check out the full menu here. Price: $98, with an optional beverage pairing ($65). Reservations for up to six guests can be made on OpenTable; for larger parties email nishireservations@momofuku.com. Two of the year’s buzziest openings are joining forces for NYE, serving prix fixe multicourse menus that highlight the best of each concept. Highlights include Winter Point oysters (served with Osetra caviar, crème fraîche and chives), sliced bluefin tuna (with black truffle vinaigrette and shaved black truffle) and spit-roasted prime rib. Price: $295 for five-course menu, $395 for six-course menu. Reservations can be made via OpenTable or by emailing reservations@thegrillnewyork.com. Chef Alex Stupak closes out 2017 with a bang, preparing multicourse family-style dinners (six courses at the first seating and seven at the second) at his buzzy Midtown Mexican destination. Following a welcome margarita (with unlimited margaritas at the second seating), dish highlights include guacamole with seven salsas, king salmon with gooseberries and pasilla mixe, and octopus tacos with celery and salsa verde. Corn ice cream tacos are the sweet ending to the meal, with the addition of Empellón’s famous avocado dessert and a midnight toast at the later seating. See the full menu here. Price: $95 for the first seating (before 7 PM), $195 for the second seating (9 PM–close). Reservations for up to eight guests can be made via the reservations tab on the restaurant website; for larger parties or private events email reservations510@empellon.com. For a romantic New Year’s Eve on the water, Celestine is offering up a six-course prix fixe menu with plates like a crudo of bay scallop and Santa Barbara sea urchin; black truffle, lobster and wheat berry risotto; and aged New York strip steak with kohlrabi, fingerling potatoes, onion soubise and amba purée. Guests at the second seating have claim to their table to midnight, when there will be a champagne toast. See the full menu here. Price: $140 for the first seating (5:30–8 PM), $170 for the second seating (8:30 PM–close). Reservations can be made over the phone or via Resy. Mediterranean spot Shuka presents “A Night in Marrakech,” beginning with an à la carte dinner service and continuing with a “feast” menu highlighting a selection of mezzes, dips and kebabs, including labneh with herbs, kumquats and crispy chickpeas; braised lamb with Medjool dates and apricots; and chicken shawarma. Things get even more festive at the late-night seating, with an expanded “feast” menu plus palm readings and a belly dancer added into the mix. Price: $75 for the "feast" menu (7–8:45 PM), $125 for the expanded menu (9–10:30 PM). Menu available à la carte from 5:30–6:45 PM. All reservations must be made via Resy. To help ring in the Year of the Dog, Simone Tong has designed a seven-course tasting menu highlighting Yunnan flavors with dishes like longevity soup with duck meatballs and winter melon; prosperity noodles with Wagyu beef, mushrooms, fresh truffle and bone broth; and a firecracker sundae. Following dinner service, an All-You-Can party offers unlimited food and drink (including beer, sake and specialty cocktails) plus a midnight champagne toast. Price: $68 for tasting menu dinner (6–8:30 PM), $108 for All-You-Can party (9:30 PM–12:30 AM), $150 for both dinner and party. Purchase tickets here. The champagne and Negroni fountains will flow (with a champagne toast at midnight, of course) all night and be served alongside a special menu created by chef Rachael Polhill especially for NYE at this West Village staple. Menu highlights include roasted lamb rack with truffled crispy potatoes, mustard and truffle jus, and for dessert, pavlova with mascarpone, raspberry, pomegranate, pistachio and violet. Price: À la carte menu served from 10 PM–12 AM. Reservations can be made on Dante’s website or over the phone.